Sarina was a nineteen year old student in Toronto the first time she visited Divine Decadence Originals. She met Carmelita Blondet for the first time and was treated to a tour of the store. After the tour, Carmelita handed Sarina her business card and said “Come back to the store to buy your wedding dress one day”. Ten years later, Sarina returned to Divine Decadence and bought the wedding dress of her dreams! We love this story so much that we have to blog about it. We will reveal pictures of Sarina in her wedding dress after the wedding. So stay tuned! Meredith Markworth-Pollack was the costume designer for the glorious television series Reign. At Divine Decadence Originals we loved having her come shop for the television show. Meredith would come to shop at our store as often as monthly! We were always so excited to see what she would pick for the show and to spot her purchases when watching the show on television. The show is a visual masterpiece and is a display of Meredith’s amazing style, design and creativity. We are so proud of Meredith Markworth-Pollack for winning the 2017 Canadian Screen Award for Best Costume Design. Way to go Meredith! Check out Meredith’s Instagram profile for some incredible insider pics and a lot of inspiration (@meredith_costumes). We at Divine Decadence Originals are proud to be a part of the Zareinu Fashion Show for the third time. All proceeds from the event go towards supporting the unique and individual needs of Zareinu students, ranging anywhere from providing much needed therapies, to equipment, supplies, technology and more. Zareinu offers families a wide range of therapeutic and educational programs directly designed and delivered by qualified educators and therapists in its main centre and in satellite classes located in other Jewish Day schools across the GTA. It is events like the Fashion Show that continue to support these programs and create more opportunities for children with special needs. Kate Moss graced Divine Decadence Originals with her second visit on May 10th, 2016! The Supermodel was in town for only one day on business. She made an appointment to see us one day before she arrived in Toronto. The next day she came in for two hours shopping for day and evening summer dresses. When Kate arrived out front, in her limo, we were so excited to see her! As she made her way up the stairs she cheered ‘hola!’ announcing her arrival to Carmelita. With the help of her personal assistant she was able to find several dresses that looked incredible on her, obviously.. This was Kate Moss’ second visit to the store but the first time Jens Krum, the manager of Divine Decadence Originals got a chance to meet her. He stands firm on his claim that Kate is beautiful, down to earth, and “the coolest chick I’ve ever met”. Divine Decadence Originals is proud to present to you and to be a part of the Etsy community with our shop; DivineDecadenceOrig. 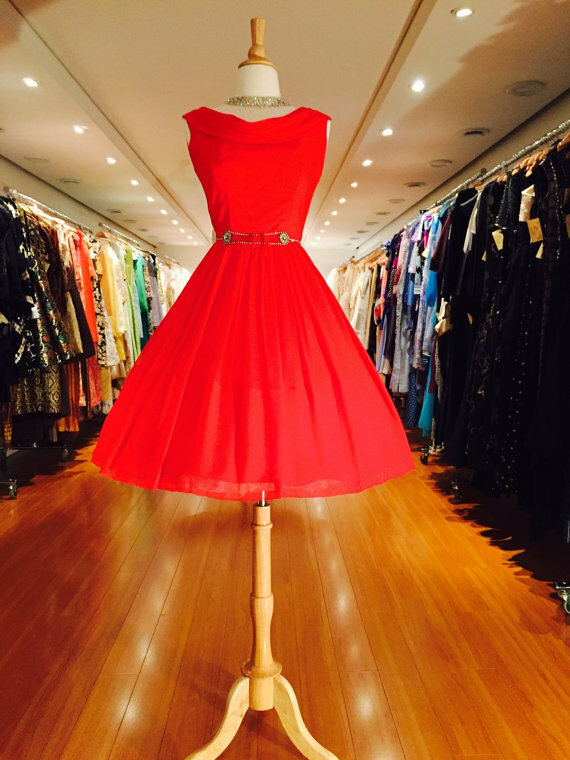 Click here to see if this fabulous red dress is still available! Divine Decadence Originals has been in business since 1972. Recently we began our new online venture with the grand opening of DivineDecadenceOrig this past July, 2015. We have twelve items posted to date and two have sold. We are now dedicating more time to our Etsy shop DivineDecadenceOrig. We currently offer discount international shipping and for a limited time continue to offer free shipping to North America! You can expect to see more and more items up for sale online. Check back often or favorite our shop to receive immediate notifications the second each new item is posted for sale. We invite you to visit us online by clicking the link below.